Top row (left to right): 1. Rick Bradley, 2. unidentified, 3. Bruce Joder, 4. unidentified, 5. Brian Rotsten, 6. Debra Sparks, 7. Bob Tarte, 8. Jennifer Murphy, 9. Richard Lawson. Second row: 1. George Friedrich, 2. Joel Streufert, 3. Jody Moniz, 4. Diane Bahr, 5. Steve Sinchak, 6. Kaye Sanders, 7. Bill Judd, 8. Lisa Tveitmoe, 9. David Anderson. Third row: 1. Ricky Stallbaumer, 2. Barbara Dougherty, 3. Matt Bandtel, 4. Donna LaFevre, 5. Steve Taylor, 6. Lori Larson, 7. Linda Reshenk, 8. Jeff Burke, 9. Sandra Cochran. Fourth row: 1. no picture, 2. Mrs Sorensen, 3. Jeff Neely, 4. Jeffrey Richards, 5. Lori Roszell, 6. Kathy Shaw, 7. Craig ?, 8. Mr Bosworth, 9. no picture. Credits: Scanned and submitted to the archive by Brian Rotsten. Thanks to Brian Rotsten, Bruce Joder, David Booth, and Sandy Nelson for identifying the kids in this picture. 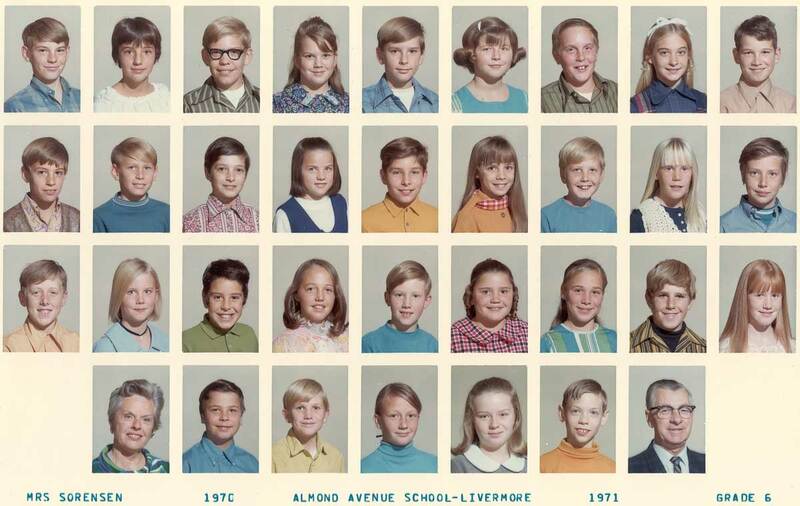 To find other pictures from Almond Avenue School in the archive, see Livermore class pictures listed by school: Almond Ave School. And if you have any pictures from Almond Avenue School that you would like to share, please submit them to the Archive.